Extra-thick padding, lumbar support, and ergo-friendly height adjustability make the Raynor Eurotech 24/7 Ergonomic Intensive Use Chair an affordable solution to subpar seating. Give your body the support it craves; with 4" thick padding on the seat and back and built-in lumbar support you'll be working better and more comfortably in no time. The Raynor Eurotech 24/7 Ergonomic Intensive Use Chair adjusts quickly with the flip of a few levers, delivering all day support to users up to 250 pounds. Give your body the customizable seating it needs with one simple office addition that can keep you working better. 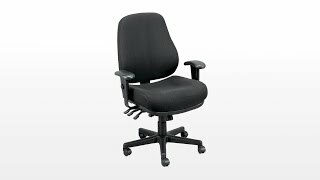 Seat Height 19" x 22.5"
The Raynor Eurotech 24/7 Ergonomic Intensive Use Chair is available in either Black or Charcoal. I have unique habits in chair-sitting, as I like to sit yoga style most of the day. So, although I'm only 5' 8" and a lightweight, I had to expand my search into the tall and large category to find a chair with a wide seat, from which arms could be removed (or not installed) and which would rise up to a height slightly above the norm. * Seat tilt, chair-back tilt, and tension control. So all the controls you could want, including locking of the mechanisms! Putting it together was intuitive and I could have done it alone (but I had help). Although there was a piece missing--the telescoping bit that goes over the pneumatic tube under the seat, that arrive a few days after I called it in, with Saturday delivery. The arms look to be super well-made, so I lingered a bit over the decision not to install them. But I stuck with my original intention and customary sitting habits. The company was super helpful on every chat and every call--quite possibly the best quality customer service I've ever experienced. I got the feeling everybody knew and appreciated the products, which seem to all be top quality. Thanks, Human Solution, for keeping quality in the office furniture market! My only negative comment would be the chair needs to be about an inch or two deeper for real comfort. I am a plus size lady and find it a little too shallow for total comfort. HOWEVER, the chair is wonderful in every other way. I do recommend it highly. No more lower back pain. No more hip pain. It has been a miracle. I had a hard time find one my company would pay for I really need the size larger but they will not pay 500 to 700 for a chair so this one did the trick. Thank you for this chair. I spend, on really heavy work days, 16 hours sitting at my desk. A chair that's rated for 24 hours of use is a find, and I still think the price was a misprint. I'm not sending it back, though. The chair is really good-looking, incredibly comfortable, and the structure is perfect for back and shoulder support over the long haul. Thank you, nice chair people. A Great Chair At A Great Price. I bought this chair after carefuly researchng ergonomivc and intensive use" chairs for about two months. I even went to several stores to try them out. There definitly some nice chairs out there but I think this one is an incredible value at this price. I needed a chair tha I coudl sit in for long hours of practicing music and using the compuer and this is it. It is built better than I expected and is truly heavy duty. This isn't just some cheap chair made to look like it's something special. This chair truly is special. At the asking price I don't know that it has any real competition. I had no problems with Human Solutions and I thought they were very helpful when I called to ask several technical questions before ordering. After I ordered everyhting was as expected and I am very happy with Human Solutions and this chair. This product comes standard with a 10-year warranty on seating components, and a 2-year warranty on the upholstery and foam (excluding armpads). $373.00 List Price: $652.00* The list price is the same as the MSRP (Manufacturer's Suggested Retail Price). It may not necessarily be the price at which the product is sold.